In case you haven’t noticed, there hasn’t been much cooking going on here lately. This is because I’ve been on the road constantly over the past two months. And, to be honest, when you travel this much, it’s not as fun as it may seem. A nomadic lifestyle has never bothered me; that part isn’t a problem. It’s having no access to a kitchen that gets old really fast. The glass-half-full people in my life have tried to point out the benefits of not cooking which is not having to do dishes. But these people are crazy, and I know better than to let their optimism dampen my spirit. I miss cooking, and I miss blogging about what I cook. Until that can happen again, here’s something that hopefully will tide you over. 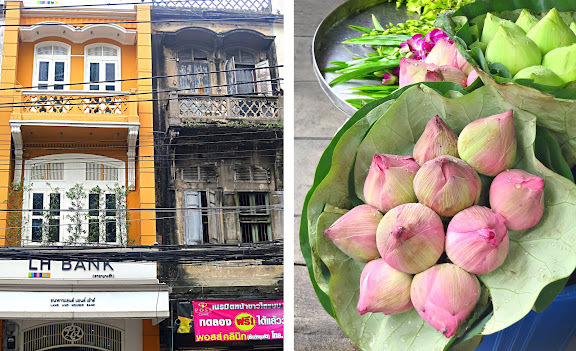 I get tons of emails from my readers asking for Bangkok restaurant recommendations and tips on how to eat “like the locals,” and I hope many find this post helpful. Well, put on a pair of comfortable shoes and pants with an elastic waist. 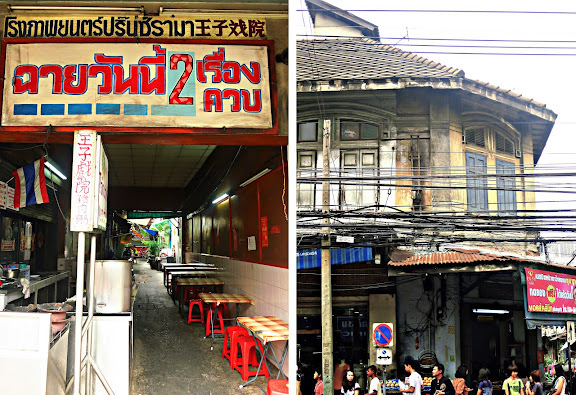 Then mosey around with me along the portion of 150-year-old Charoen Krung Road from Saphan Taksin BTS Station to the Silom junction for eating in historic Bang Rak is as “like the locals” as it gets. No need to pay for a tour guide; you can do this. The walk isn’t long, the shops are easy to find, and no matter what you point at, chances are it will be good. For the list of the ten best restaurants and stalls in this area, please go to my CNNGo article. This post merely provides additional commentary. Bang Rak is an example of how the coexistence of immigrants from different cultures forms a sum that is greater than its parts. Cultural diversity is what makes this neighborhood as interesting as it is. Right next to the Saphan Taksin BTS station is a 150-year-old Hainanese-style shrine erected for, according to legend, a group of Hainanese who set sail to Bang Rak but were mistaken as pirates as they were passing through Vietnam and killed as a result. Not too far away is Haroon Masjid, one of the oldest masaajid in Thailand (and quite beautiful!). The Muslim presence in Bang Rak is not as strong as that of the Chinese, but if you pay attention, you’ll see the Shahada and Halal signs here and there throughout the area. Europeans are also well represented in Bang Rak. Louis T. Leonowens, son of the famed Anna (and the king of Siam), found a trading company in this area. The survey and mapping of Charoen Krung Road, the first paved road in Bangkok, was headed by a British diplomat, Henry Alabaster. Many restaurants in this charming area are anywhere between 70 to over 100 years old. Still located in the two-story shophouses along Charoen Krung, these places are now run by second- or third-generation cooks who are proud of their heritage and try to preserve as much history as possible by staying true to their ancestors’ recipes and the way they conducted business. 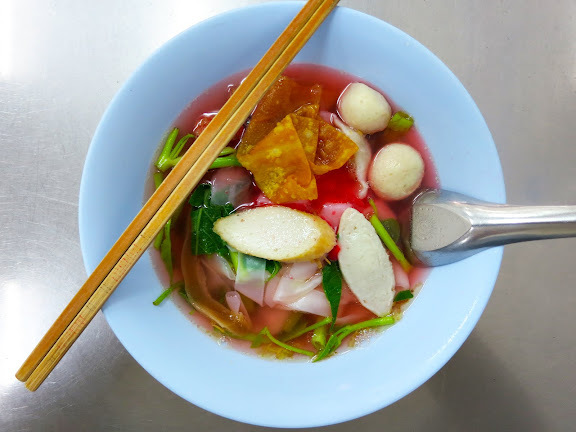 I have listed Boi Kia (also Bok Kia or Bo Kia depending on whom you ask) by Je Niao as one of the top ten must-try foods in this area. 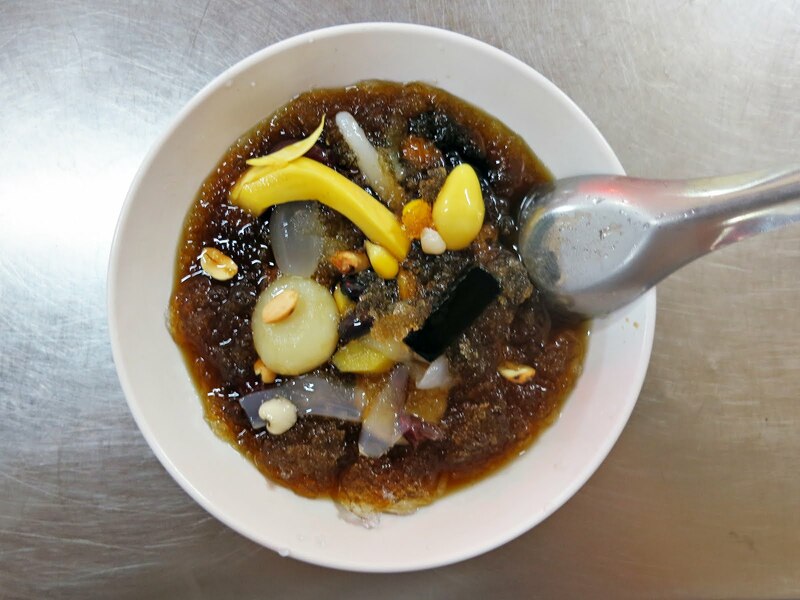 This is a Hainanese dessert featuring glutinous rice flour dumplings and so many other things from cooked beans to water chestnuts to Chinese grass jelly to candied tubers to fresh jackfruit — all served in the same bowl with brown sugar syrup and crushed ice. Oh, there are cooked corn kernels in this dessert too. This might take some getting used to, if you’re one of those who can’t comprehend the appeal of corn in desserts (Corn Lover Kream Ball, anyone?). Asians love corn in our sweets. Check out my sweet corn-coconut “salad” and tapioca-corn pudding with coconut cream. Boi Kia is so good, so refreshing, and has so many flavors and textures in one bowl. I could eat this every day. Muslim Restaurant is another one of my favorite. The place doesn’t look like much, and most people don’t even notice this old restaurant. In fact, if I didn’t know better, I’d probably not think that any good thing could come out of it. But, boy, does this place know how to make oxtail soup. Their goat biryani is also a star. When I go alone, I order a plate of goat biryani, a bowl of oxtail soup, and a glass of lassi. When I go with a friend, I’ll add to the usual ensemble goat liver masala and an order of murtabak (which the Thai call “mataba”). Muslim Restaurant is a bit pricier than others in the area, but it’s completely justified. If you ever visit, say hello to Manee Pakayawong, daughter of the original restaurant founder, Hajee Maidin Pakayawong, a goat farmer and butcher well known to people around the area formerly known as Bang Rak market (where Robinson is now located). Manee oversees her restaurant from the cashier counter and usually doesn’t have (or look like she wants to have) interactions with the diners. But, oh, she’s such a sweet, sweet lady. We’re moving on to Jok Prince. If you don’t want to walk into the dark alley where Jok Prince is located, I don’t blame you. After all, this little dark pocket was once the location of a movie theater where questionable movies were shown, and though the theater is no longer in business, you can still see remnants of its seediness. But I would want you to walk in, though, for this is where you can get the best Jok (pronounced “joke”) in the area. This localized version of the original Chinese rice congee features silky balls of ground pork, fresh ginger slivers, and a small ladle of concentrated broth in which the pork and offal are cooked. Those wanting extra creaminess, ask for an egg in your jok. A raw egg will be cracked into a hot bowl of congee which in turns partially cooks it. Don’t think too much; just stir the egg in with your spoon, and see for yourself how great that tastes. Or you can do what I always do which is ordering a side of Chinese crullers (yu tiao), which the Thai people call Pa Thong Ko, and eating those along with my congee. Bliss. It’s hard to list out everything that’s available along both sides of this portion of Charoen Krung since the variety is so great. 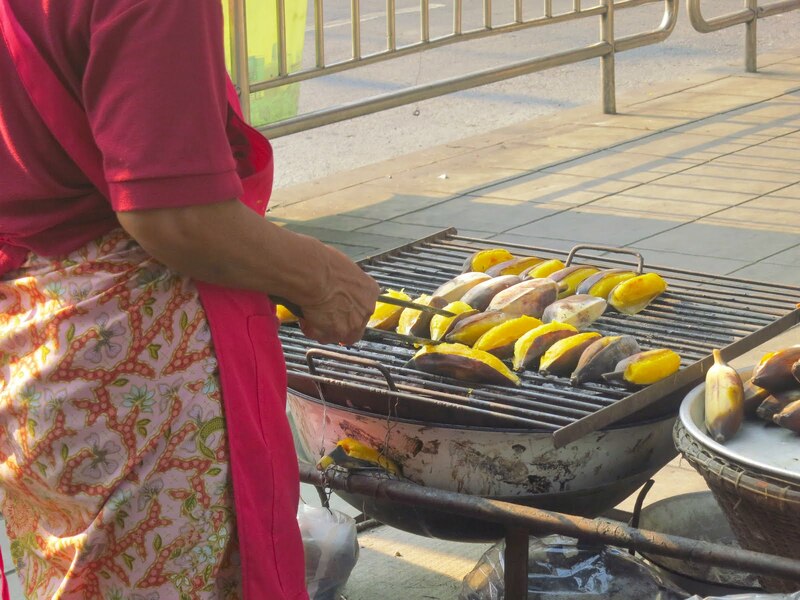 But of all of the miscellaneous street foods, grilled Silver Bluggoe bananas (kluai hak muk) are my favorite. If you see them being grilled, be sure to grab a few. Silver Bluggoe is an ideal type of bananas for skin-on grilling. Once grilled, the skin turns charcoal black and somewhat brittle on the outside and the flesh turns soft and a beautiful shade of yellow. Some of the smoky bits inevitably stick to your fingers as you peel the grilled bananas and get transferred onto the banana flesh which, not having direct contact to the coals, is actually steamed in its natural packages (kind of like the steaming effect that you get when grilling ears of corn with the husks on). Sweet-as-honey, soft bananas with smoky, charred bits don’t need anything else; they are to be eaten as is. Four of these chubby grilled bananas are filling enough to be a meal. They cost only about 30 cents in US currency. With the population being predominantly Thais of Chinese descent who abstain from beef, one thing I need to tell you is that it will be very hard, if not entirely impossible, to find any beef dish in this area. Pork is the main meat of choice, followed closely by chicken, with fish and duck trailing behind. But the fact that the cooks here know what to do with those meats more than makes up for it. With all the wide variety of foods available here, even the most ardent steak lover will find something they enjoy. Noodles with assorted fish balls are really good in this area, and you should try a bowl. Make it two: one with broth and one without. And if it gets too warm, quench your thirst with ice cold Chinese herbal drinks. 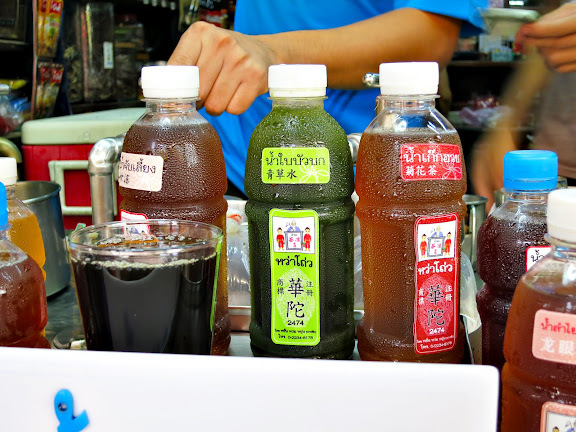 They’re made from anything from the more familiar such as Chinese chrysanthemum (nam kek huai), dried longan (nam lam yai), to the more medicinal such as Gotu Kola (nam bai bua bok) and all kinds of secret herbal blends. Also — and even those in the US know of this — if you’re a fan of the Healthy Boy seasoning sauce brand, come by its birthplace, Yan Wo Yun, which is a wee shop selling cold herbal drinks and many different kitchen pantry items. 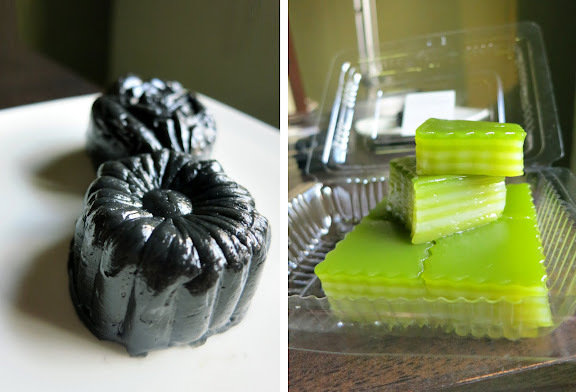 Traditional Thai desserts are found in abundance around here as well. Boon Sap Thai Desserts is one of the most established Thai dessert shops in the area. 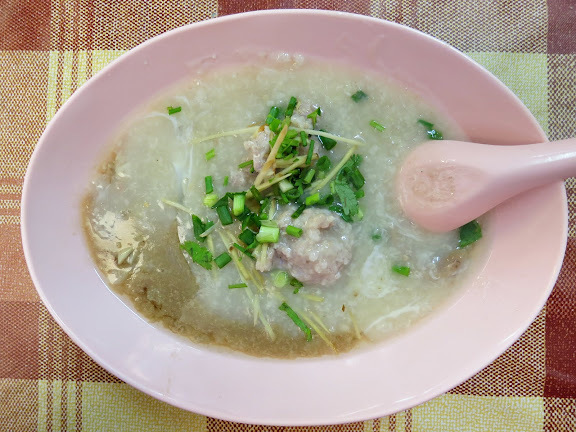 The third-generation proprietors still make the same treats according to the original recipes belonging to their Grandma Boonsap, the original founder. No mass-produced desserts. Palm sugar and coconuts are still ordered from quality sources in the South of Thailand. 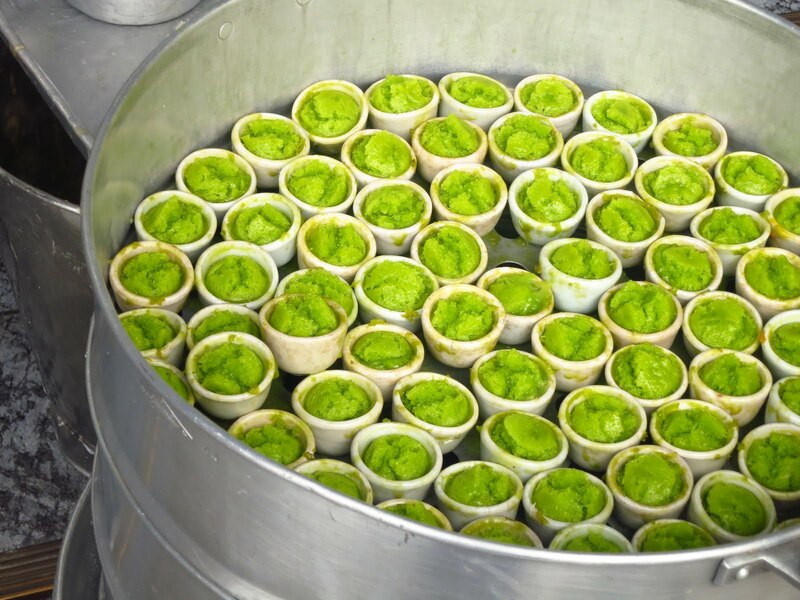 No artificial green coloring to mimic the color of pandan juice. The black rice flour pudding in the above image is still made the traditional way, i.e. with pulverized burnt coconut fiber. 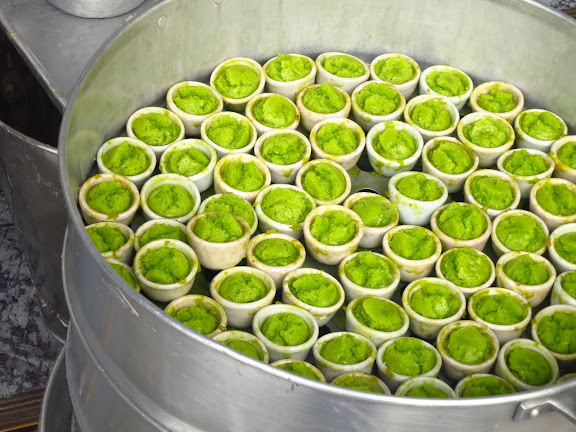 Be sure to get their extraordinarily silky steamed Thai custard. I don’t know what they do to achieve that fine texture. All I know is I’m going to clone it. Yes. There are two roasted duck restaurants in this area both of which are loved by the locals: Prachak (ประจักษ์เป็ดย่าง) and Nai Sung (เป็ดย่างนายสูง). I personally prefer Prachak and have included it on the previously-mentioned list of ten best eats. I still stand by my opinion. Nai Sung does make great Cantonese-style roasted ducks, however, and I felt I needed to mention that. Besides, they have this thing which Prachak does not have: ap kiap pao (อับเกี้ยบเปา), a dish older than a century which the people at Nai Sung have told me no longer exists anywhere else in Thailand but there. 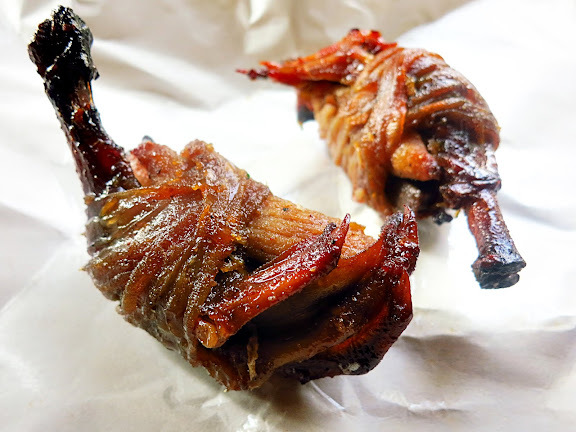 Ap kiap pao is basically duck feet (no pedicure needed) each of which is stuffed with a piece of Chinese-style barbecued pork and a piece of pork or duck liver, wrapped tightly with duck intestines. They’re then skewered onto metal rods and roasted. The verdict: I love the novelty of it, and I love the fact that I get to eat something that may not be around much longer. But will I suffer without it? No. The taste is one-dimensional and a tad on the cloyingly sweet side. There is hardly any meat I can gnaw off the duck feet. The pork and liver are so dry they’re actually unpleasant to chew and swallow. The duck intestines are so tough and rubbery that at one point I wondered whether they were meant to be eaten. Maybe my taste is too pedestrian for a delicacy like this, but I just don’t get it. I’ll give them a perfect 10 based on presentation alone, though. Very creative. 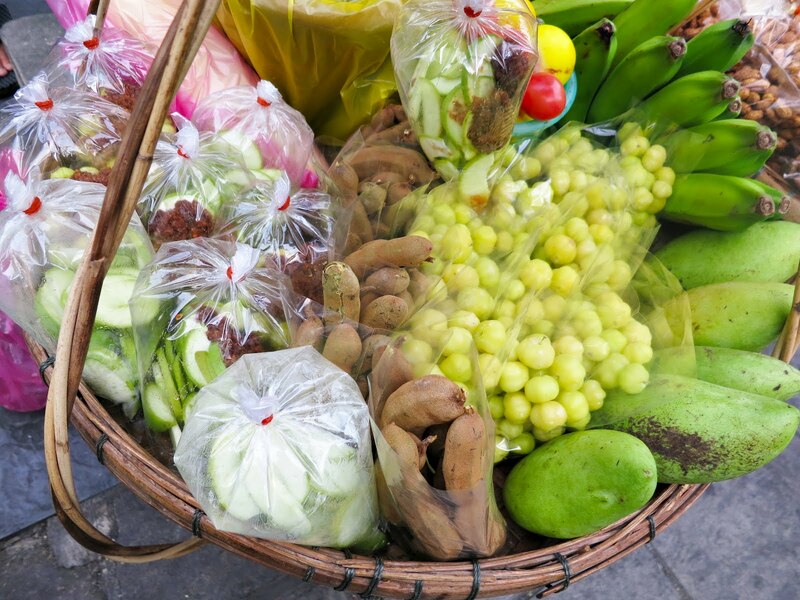 It’s harder and harder to find street hawkers who walk around with two baskets (hanging on a bamboo rod resting on one shoulder) full of miscellaneous things, both edible and inedible. One of such hawkers often parks her baskets on the sidewalk in front of Robinson, and it’s always fun to check out what she offers each day. Never the same things. Never things that you’d expect to see together or consider as belonging in the same category. That day she had in one basket assorted sour fruits from young green tamarinds (one of my favorite things of 2011) to green mangoes to star gooseberries (they come pickled in the US) to ma dan (Garcinia schomburgkiana pierre) that is so tart that all you have to do to feel exactly where your saliva glands are located is simply by looking at them. In the other basket? Turmeric powder, pumice stones (for sole exfoliation), and wooden slingshots. Don’t ask me to explain why. 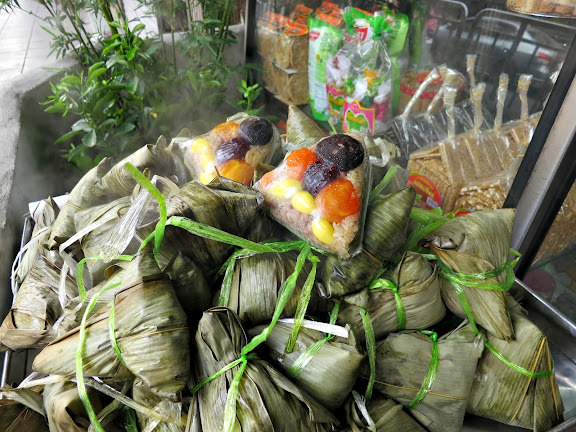 I’m a fan of Chinese glutinous rice dumplings, zongzi (or ba jang as we call them here in Thailand), but I’ve never tried ones made by this vendor who seems to be the only one in the area that makes them. So I have no idea if they’re any good. Ginkgo nuts, shiitake mushroom caps, and cooked salted duck egg yolks make for a pretty colorful presentation, though. Oh, hoy tod (official: hoi thot). Those crispy, eggy pancakes of fresh mussels have got to be some of the best foods the streets of Bangkok have to offer. Thip Hoi Tod Phu-khao Fai (volcanic fried mussels) is a place where you want to visit if you ever come near this area. I’ve talked about the history of this place and how it has been named such in the CNN article, so I won’t repeat it here. All I’m going to say is that you have to give it a try. People have different opinions about what makes hoy tod good. For me, the batter needs to have the right ratio of gooey to crispy, the mussels (or oysters) must be fresh, and the bean sprouts must be only slightly wilted so they’re tender-crisp instead of soft and sad. Thip is doing a very good job at ensuring every plate is exactly like what I’ve just described. Hia Nuat, located right at the entrance of Charoen Krung 50 and almost right across from Thip Fried Mussels, is another good eat which you should not miss. It’s a food cart which doesn’t set up until very late in the afternoon, so plan your day accordingly if you’d like to taste Hia Nuat’s really, really good Sai Krok Isan (northeastern Thai soured sausage). One item which stands out from the rest is grilled naem (the same kind that you use to make Yam Naem Khao Tod). Instead of pressing loose soured sausage meat into banana leaf packages (or, as more commonly done nowadays, plastic bags), Hia Nuat forms the fermented meat into flat balls and cook them over low coals on bamboo sticks (they look like lamb koftas). Those who have been afraid of eating their naem raw, this is one way you can cook it in addition to fried or baked soured pork ribs and braised-then-seared beef short ribs. There’s nothing else to say other than that you should not leave this area out of your itinerary if/when you visit Bangkok. 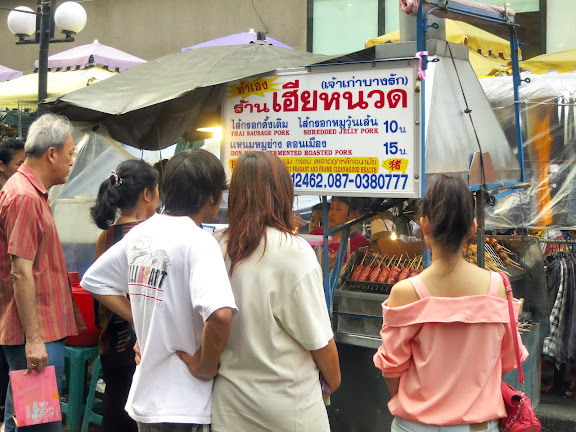 For those short on time and want to make the most of your trip food-wise, try to cram Bang Rak and Or Tor Kor Market into one day and I can assure you, you will eat more like the locals in one day than those who spend a week on Khao San Road. Leela, what do you think of Chote Chitr near Khao San rd (but thankfully far enough away) in Bangkok? The real deal or tourist trap? Don’t see many Thais eating there. Chote Chitr’s mee krob, grilled eggplant salad, and several other dishes are still well done, even if not entirely consistent. I have made a dozen trips over the last decade, but I’m sadly going to not recommend the place anymore simply because the owner’s attitude towards her customers is so singularly dour as to cancel the effect of any of the flavor and art in her staff’s cooking. The owner is so very unpleasant. The experience is completely off-putting. 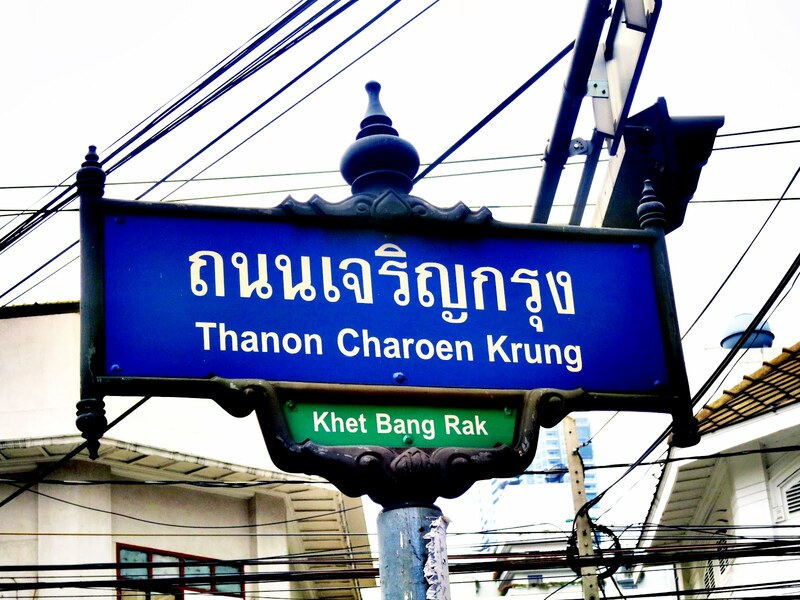 Nat – Oh, Chotechitr is far away from Khao San. Thank goodness. Personally, I think it’s hits and misses. Some dishes (mostly salads) are excellent, and some make me wonder whether they’ve been taste-tested by the same person/people. In general, I wouldn’t consider it a tourist trap. At the same time, there are several other restaurants that deserve more press than this one. I so miss Thailand! Wonderful post,thanks for the tips! The best Thai food I have inside or outside of Thailand were in places that nobody would remotely expect to have good food. The best pad kaprao( which I think is the Thailand national dish if that could be considered a possibility) was at a mini-mart stall that was part of a Thai woman’s townhouse in the middle of a housing complex that nobody would ever be able to find. The best som tam I ever had was in a corporate building cafeteria on Silom. It was som tom Thai, not the Isaan style, because I don’t care for plaa ra. The best yam moo yang/nuear I ever had was at a food stall underneath a walking bridge on Ploenchit. The best Thai seafood I ever had was on a small soi in Phuket made by a family from Chiang Mai. The best larb I had was at the old Don Muang airport. The best Panang Moo I had was in a 2nd Star hotel, a dish that I can still never get out of my mind even to this day. I used to hate Gaeng Som, but I realized I never had it made properly until I ate it at one of these random Thai pub/discos off the beaten path. I have had these dishes and others probably hundreds of times, but can always remember my favorites. It is weird, I have eaten at some places that would be considered famous and was never wowed, but have always had the best food at places that were found by mere fate and random circumstance. Bangkok is so massive that it is almost impossible to eat bad food anywhere in the city unless you are having some really bad luck. I would say from experience though that the food you get on Khao San(except one place that sells joke) and in the touristy areas I found not to my liking because they were adjusted for foreign palettes. But that is the paradox, some people may not like it the Thai style and prefer the adjusted style. Serfie. Verily thou art on the correct path. Correct path as in…what? Walking around aimlessly hoping to hit a jackpot? I don’t even know what this is. Reverse snobbery? I appreciate people who take the time to do research and write recommendations like this for those of us who get to spend one week at the most in Bangkok every 2-3 years and want to make the most of our time by zeroing in on the places approved by the locals. Famous restaurants are famous for a reason and it’s not always about hype. 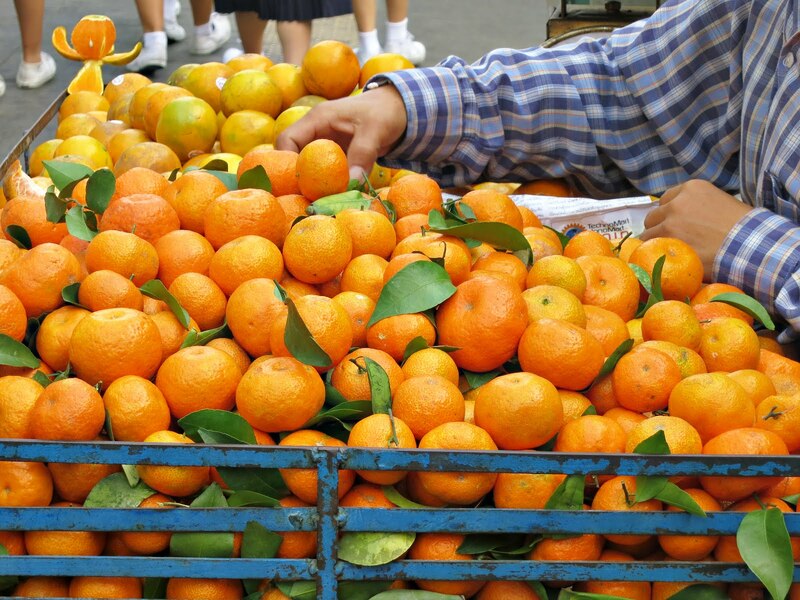 hey leyla, i just got back from a short trip to bangkok and hanoi and managed to set off on your culinary trail!! 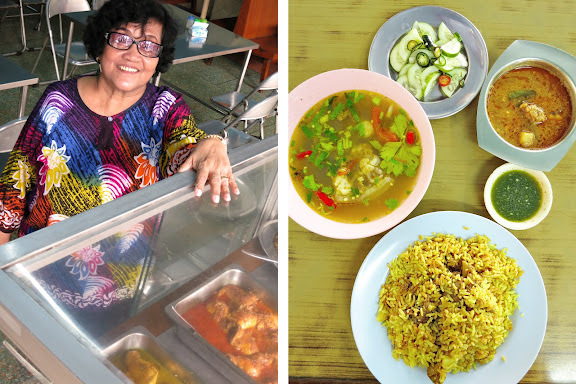 tons of revelations, but the biggest one i had was that all that i tried– the oyster omelette, the duck, the thai desserts and the muslim food– are all very much straits cuisine that we have here in Singapore. that really got me thinking of the influence of trade and the movement of people and their food as they set up shop in new trading places hoping to prosper. 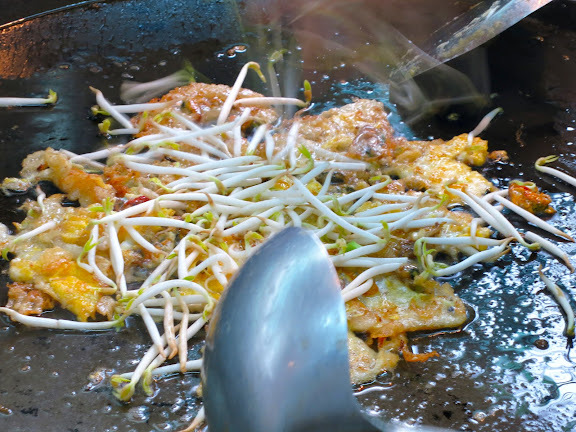 please publish more places on where you’d recommend to eat in Thailand or SEA region– it really makes for interesting gastronomy trails! michlhw – Glad you’ve found this to be helpful! Ha. I know right away by the way you’ve formed the plural “masaajid” that you know Arabic!